What to Wear to your Portrait Session? The answer to this question is so IMPORTANT to the success of your portrait! People really stress about their portrait clothing – for good reason. Like the clothes you are wearing! That might seem like a silly statement BUT if you wear something just because you think it will pass the “what to wear” test and you actually don’t even care for that particular dress/shirt/pants, trust me, you’re not going to like it any better in a portrait. Look in the mirror and make sure your outfit fits you well and flatters your figure. For a family portrait, the MOM should pick out her outfit first and then dress everyone else to compliment what she is wearing. Mom gets to be queen supreme in the situation. 2) Coordinate with your environment. 3) Just say NO to the portrait uniform! It’s important to coordinate portrait clothing but unless you wear exactly matching outfits in real life, you shouldn’t wear them for your portrait session. Coordinate in color families, shades of color, complimenting colors. Mix up textures and small patterns. 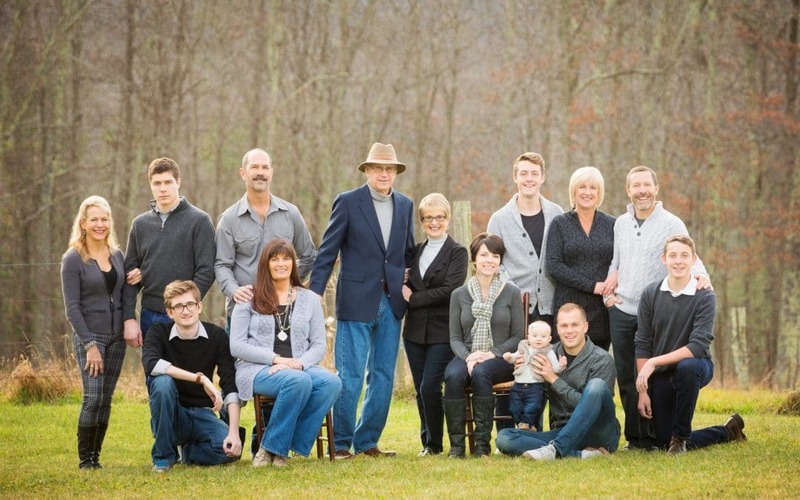 Check out examples from our Family Portrait Gallery for ideas: Click HERE. 4) Dress on the same scale of casual/formal. If one person in the portrait looks like they are going to a formal dinner and another looks ready for the rodeo, that just won’t work! Find the sweet spot between dressy and casual and have everyone on the same page of the portrait playbook. Tip: Usually more dressy clothes are going to work better in an urban or architectural setting. If we’re in the woods, fields, etc., it’s wise to go with a more casual approach. Jackets, sweaters, vest, and accents such as scarves photograph well and can sometimes help hide body parts that you are sensitive to! Layers add visual interest without being distracting. Layers are AWESOME! 6) Everyone should wear the same tonal range so that the clothing blends. One or two people wearing much lighter or much darker clothing will stand out from the rest. The lightest part of the portrait will stand out and the darkest part of the portrait will recede. 7) Let me help you shop your closet or shop online! Lots of our clients send texts with pictures of the portrait clothing they are considering wearing and then I can give the thumbs up or down. I’ll be honest! I’m also happy to shop your favorite online store and let you know if I see something that would be great. Check out our Pinterest page for suggestions I’ve gathered from around the web. Click HERE. Please note that many of the images you see were not created by Burton Photography but in my opinion, will help you make successful clothing choices for your portrait session.